The Tasmanian Museum and Art Gallery (TMAG) is open daily between 10:00 am and 4:00 pm from 26 December until 31 March. It is open Tuesdays to Sundays between 10:00 am and 4:00 pm from 1 April until 24 December. TMAG is also open from 10:00 am - 4:00 pm on Monday public holidays year-round. The museum is closed Good Friday, Anzac Day (25 April) and Christmas Day. All groups visiting the Tasmanian Museum and Art Gallery should book a minimum of two weeks in advance of your proposed visit date. TMAG is located in Dunn Place, Hobart and is accessible in the following ways. Pedestrian access to Dunn Place is available via the landscaped boulevard that connects Davey and Macquarie streets. 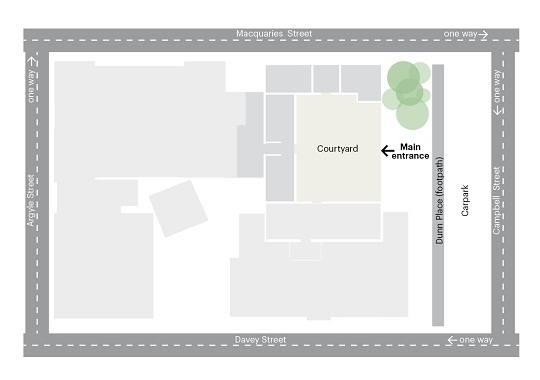 Metered parking is available in the Hobart City Council car park located directly in front of TMAG's main entrance (vehicle entry from Davey Street). Alternative parking is available at the nearby Market Place Car park. Commercial taxis will be able to deliver you close to TMAG's main entrance via Davey or Macquarie Streets. If you require a taxi collection at the end of your visit, please ask for assistance at the Visitor Information desk. Alternatively, a taxi rank is available at the nearby Grand Chancellor Hotel (Davey Street). Metro Tasmania operates several bus services that travel to and from the nearby Hobart City Bus Mall (a short, 5 minute walk from TMAG's main entrance). For further information about public bus services and timetables, visit the Metro Tasmania website. 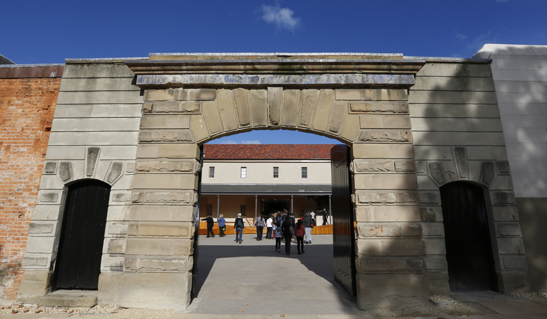 The main entrance for visitors to the Museum and Art Gallery is through the historic Watergate wall on Dunn Place. There is level access to all public areas of our site and elevators are available for movement between levels. Loan wheelchairs are also available from the Visitor Information desk. Booking a loan wheelchair in advance of your visit is advised and can be organized by phoning (03) 6165 7000. Guide dogs for the visually impaired are welcome in all gallery spaces and to all TMAG events. Cloaking facilities are available at our Visitor Information Desk. We ask that all backpacks, large bags, umbrellas, food and drink are left in the locker area prior to entry. A $2 coin is required to use the lockers, which is refunded at the end of your visit. For your comfort, the comfort of other visitors and to ensure the safety of the TMAG collection, visitors may not eat or drink in the galleries beyond our Visitor Information desk. Smoking is also not allowed anywhere on TMAG property. Visitors who wish to smoke will need to exit on to Dunn Place to do so. Visitors are invited to take photographs for personal use within the Museum and Art Gallery unless otherwise indicated. Please note use of flash and tripods is not permitted. Noting the advice on photography above, visitors are welcome to use their smart phones and devices in TMAG galleries. Everyone is asked to be mindful of noise levels and thoughtful of other visitors. You can download a copy of our Vistor Guide and Map here to help plan your visit. This page was last modified on 26th September 2018.